I’ve been using flickr since it started in 2004. It’s been my number one place to store photos – i have over 50,000 at this point. However, I need something else to be my main photo storage. Why? Mainly since now that mobile is taking over, the way I take and manage pictures is different. For me, my phone is my primary camera and has wifi, so should be able to easily upload and manage photos from it. However, I still need to do some advanced functions that are hard to do on a phone, so desktop UI should allow this. Second reason is because yahoo got bought by Verizon, leading me to wonder about flickr’s future. Enter Google Photos, which I’ve been using now with Android phone for almost 2 years. I tried Google Picassa a while back, didn’t like it for some reasons (desktop focused), loved it for others (good for power users). Picassa has been slowly been replaced by google photos, and most of key features have been ported over. Organize – Flickr has an advanced web interface to create and organize photos into albums and collections. Browse – Anyone can browse my collections of albums. This used to be super easy, but UI changed recently and its not as easy. Adding – Easy and fast to get photos from phone to an album I can share with people. Just like google web search, any word I explicitly add to photo allows me to search and find that photo later. Basically tags. Adding Description when I take photo in Android. This one is a bit tricky – Right now, the Google Photos Android app will only show the Description field after the photo has been uploaded to the cloud. This is only an issue when you do not have internet or have very slow internet. With fast internet, you can solve this by force syncing, waiting for it to finish, then clicking Info icon and entering your personal meta details in Description field. Last week a book I made and printed using blurb.com arrived. 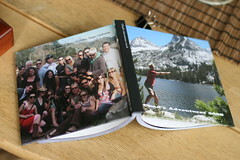 It’s one of many photo books I’ve made (see qoop books), but my first using blurb. I liked the control i had when making it – There’s an app for the mac that lets you pick a template for each page and add pictures and text accordingly. It took me a while to figure out what pictures to put in there, plus write text for each one. I ordered a 7×7 book, 200 pages, Hardcover with image wrap (no dust jacket). It was $48 + $8 shipping. see more blurb prices. I am quite satisfied, the quality is close to that of regular books. My only complaint is that a couple of my pages didnt’ print – the inside flap – I assume its because i opted for no dust jacket. Sigh. Compare cover to blurb preview, also compare to Qoop Books. That’s right. The 3rd in Canon’s Digital Rebel XT series, this one called the Digital Rebel XTi in the USA, but i like to call it the Canon 400D – less confusing. Why? For me, the main reason is to get 25% more megapixels – it has 10MP instead of 8MP. Also, i like the bigger LCD screen on back, auto-dust cleaner on the internal lens, and improved 9-point Auto-Focus system. Read more about it on digital photography review. For the record, i bought it used off of craigslist for $700 – that price includes all accessories and a 18-55mm lens, which i plan on selling with my 350D. I figure this upgrade costs me about $200. I got a third lens for my collection – this one is a NICE. The 70-300mm DO IS USM Lens. This is a bad boy. First, on the techie tip, the DO indicates Canon’s new Diffractive Optics technology, which means i can have a 300mm lens in a tiny little package (great for travelling, why i bought it). Also, the IS (Image Stabilization) is improved so much that its equivalent to 3 f-stops when hand-holding. You can really notice this – makes taking pics much easier. This will be a great compliment to my 17-85mm lens. I can now take pics of somebody’s face from a hundred feet away (like this). Hurray. I got my new pocket-size digital camera, the SD600 today. I bought the SD450 only a few months ago, but on my recent trip to New York and Philly, I smashed the LCD screen. I’m not sure how, but i prolly put my keys and the camera in my pocket together, and i think the keys applied pressure to that huge 2.5″ LCD screen. But the SD450 was great, so i wanted another one. I spent a few more bucks this time and got the SD600, which is pretty much identical to the SD450 except its 6 megapixel instead of 5, and takes better shots in low light (due to ISO 800). Also, I’ve been enjoying my Canon 350d that i got a few weeks ago, so i decided to get a second lens – the 50mm F/1.4 lens. My friend dennis has one, he loves it, as do most people. I chose the 50mm because it is quality yet affordable, does great portraits and works well in low light without flash (gotta love that f1.4 aperture). I’ve found that my 17-85mm does a good job all-around – the 17mm is enough wide angle for me for indoor room shots, and the 85mm has enuf zoom to get decent shots from far away. However, i do want to get another telephoto type lens, but i’m not sure if i want a zoom lens, like the 70-200mm($600), or a fixed-focal length (prime) lens, like the 135mm($800) or 200mm($600). Yep, today I dropped a grand on a camera and lens. Took the plunge into the Digital SLR world. With all my free time and travel coming up, i needed a nicer camera, and after a bit of research, i went for the 350D. I’m not going to bore you with how i picked, but basically the 350D is arguably the best value under $1K. You can compare canons or compare 350D to Nikon D70 for yourself. – panaramic shots of nature – beaches, mountains, lakes, etc. – wide angle shots indoors – dinner table, people in small rooms, etc. Today I just got one lens in addition to the 350D body, both from craigslist. The body was $550, and i got a 17-85mm like-new lens from his buddy for $450. A good intro lens – not too expensivve, a little bit of macro (1.2 feet), a bit of telephoto, got the IS (Image-Stabilization) for low-light. So Thats $1,000 total. One grand. Lets see if i really use this and want to spend more on even nicer lenses.